Welcome to Putter's Pool House! This beautifully decorated 4 bedroom 3.5 bath home is located on a quiet side road in Grand Beach and is absolutely beautiful inside and out. The pool will keep your family busy for hours and if you need something else to do, you can enjoy the nearby Grand Beach playground, tennis courts, and basketball courts, or simply take a quick stroll to the beach. As you enter the home a hallway leads you to the master bedroom to the right and the primary living area, kitchen and dining area to the left. The spacious kitchen is superbly appointed with high end appliances, stone counter tops with breakfast bar seating for four, and is open to the dining and living area, which allows you to interact with your family while preparing meals. Adjacent to the kitchen is a lovely harvest table around which the family can gather and a large living area with comfortable seating situated around a gorgeous stone fireplace. Off the living area is a fantastic screened in porch with dining table and patio seating perfect to dine or relax outside during our great Michigan evenings. The master bedroom is on the main level and is furnished with a king bed and en suite full bathroom. As a plus, the entire master bedroom wing closes off for privacy. There are two bedrooms on the upper level, with 2 twin beds in the first and a queen and a twin with a trundle bed in the second. There is a cozy TV loft at the top of the stairs where you can relax in peace while overlooking the main floor. The newest addition to Putter's Pool House is the finished lower level with a fourth bedroom and a high-end media room including a 65 inch flat screen TV, premium surround sound stereo system, and great seating. The adjoining fourth bedroom is completely enclosed with a queen bed and has plenty of windows to let in the natural light and provide a view of the outdoors. Putter's Pool House has all the amenities you could ask for: wireless high-speed internet, gas grill, indoor and outdoor stereo sound, a personal gym with 1/2 bathroom in the finished garage, and a pool with a fully retractable electric pool cover. There is even a golf cart available for licensed drivers over the age of 25 - local Grand Beach usage only please! 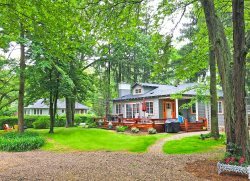 This is the perfect vacation home to enjoy Michiana! Smooth process, good communication, quality properties. Wonderful experience! Appreciated the fact it was well stocked with supplies. Loved the pool and golf cart. Spacious for our family. Everything was very nice! Jon and the office staff are great to work with. Will you have a Grand Beach office location next year, right of Rt. 12? Second year at Putters Pool was great; want to to do year three same time in 2017. Bedrooms and living space is great for our family group, in ground pool gets a lot of use, the secluded back yard provides privacy, the garage/fitness center is weel-esed by our group, as is the golf cart. Great entertainment spaces inside and pool area outside.